Dr. Moe’s personal experience with chiropractic has had a huge impact on his life at a young age and motivated him to pursue a career in the profession. 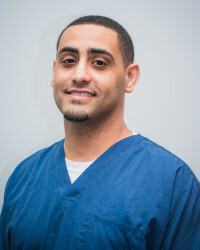 After completing his degree in Exercise Physiology at the University at Buffalo, he went on to earn both his Doctor of Chiropractic and Master’s in Nutrition at New York Chiropractic College. As a student, Dr. Moe served his country as a member of the Army and Army National Guard. He showed great excellence and leadership while serving in the military. Dr. Moe earned Soldier of the Year for two consecutive years. He has been very active in his community by volunteering at the Veterans Hospital, as a wrestling coach and as a board member of ACCESS in western New York. Dr. Moe carries that same commitment and dedication to his patients by helping them live and maintain their health at their optimum potential. His goal is to continue to spread the word about chiropractic to inspire and help people achieve their health goals. On a personal level, Dr. Moe is a family-oriented person. He loves spending time with his wife and five kids. Dr. Moe is an avid athlete and enjoys playing football, basketball and doing martial arts. He believes life is a proactive process, not a reactive response. Are you ready to empower yourself to take great care of your health? Contact Chiro First Wellness Center to schedule your time with us.